"Comes with disks to get you started with a daisy, flower, sunflower, fleur-de-lis, butterfly, bear, shell, leaf, heart, snowflake, tree and a wreath." "The 1/3" blade makes it easy to cut through the dough but still safe for kids to use." "The rings slide easily on and off the pin, and have measurements marked right on the rings." "There are measurements along the edges, and circular measures for making round pie dough that’s the perfect size for your pie plate." "This kit makes it easy to flood that royal icing onto the cookies, and also includes tools for fancier techniques." "The design is perfect for sneaking under baked cookies on the cookie sheet." "The aluminum conducts heat evenly so your cookies will rise and bake evenly, and the reinforced rim keeps the sheet rigid, so it will never warp." "The four piece set nests easily for storage and gives you options for just the right bowl size for pre-measuring ingredients." "Each rack has fold-down legs, and the legs allow the racks to be stacked." "The soft-grip handles are easy on the hands, so you can fill several sheets full of cookies in comfort." If you like spritz cookies, you need a cookie press. Oh, sure, you could make the spritz recipe and bake little mounds of dough, but a press gives you decorative cookies with very little effort. Just load the dough into the press and extrude the dough right onto your cookie sheet. The OXO press has a nonslip base that keeps it stable on the cookie sheet, and a large non-slip lever that makes it easy to dispense the dough. The press disassembles easily for cleaning. Cookie presses usually include rather generic disk-shaped dies that make flower-like cookies, but the OXO cookie press goes a step further, with seasonal dies that create more intricate and unusual designs. The press comes with disks to get you started with a daisy, flower, sunflower, fleur-de-lis, butterfly, bear, shell, leaf, heart, snowflake, tree and a wreath. You can get add-on cookie disc sets according to when you typically bake. There is an autumn, Halloween, Christmas, and spring add-on set. If you love making roll-out cookies, you’ll adore this set of 101 cutters. With pretty much any shaped you'd ever want or need this bundle covers holiday's such as Valentine's, Fourth of July, Christmas and Superbowl. And has basic shapes like letters, numbers, animals and more. The 1/3" blade makes it easy to cut through the dough but still safe for kids to use. When you're done cutting clean up is a breeze because they are dishwasher safe. When you’re reading a cookie recipe that requires the dough to be rolled to a 1/4-inch thickness, how do you measure? And how do you make sure the thickness is even all across the dough? That precise thickness means cookies with bake evenly, but it’s not easy to achieve with a regular rolling pin. This pin, however, includes removable rings that ensure that you’re rolling a precise 1/16, 1/6, 1/4 or 3/8 inch thickness. The rings slide easily on and off the pin, and have measurements marked right on the rings so you’ll always know what thickness you’ve chosen. When you’re done making cookies, you can use the pin for pizza or pastry dough, or remove the rings to do some free-form rolling. The pin is made from beechwood and the rings are plastic. This should be washed by hand. This pastry mat makes cookie making easier with its nonstick surface that makes it easier to lift your cookies off the mat, while it also makes cleanup a snap, since the mess is contained on the large 20" x 30" mat. Even better, you can use this to roll cookies on any flat surface, so when you’ve got more helpers than kitchen space, you can use this mat on your kitchen or dining room table. The mat’s bottom surface is designed so it won’t slip or skid as you roll, so you can put pressure on the dough you’re rolling without worrying about it getting away from you. This is more than a simple mat, though. It also has handy conversion charts printed on the surface, so you won’t need to dig out a cookbook or calculator when you need to adapt a recipe. There are measurements along the edges, and circular measures for making round pie dough that’s the perfect size for your pie plate. If you have a large enough baking sheet, you can also bake on this mat, since it’s oven safe to 450 degrees. This is easy to wash with warm, soapy water, or it can be washed in the dishwasher. For storage, it can be rolled to save space, or store it flat. To avoid damage to the mat, don’t cut on it with sharp knives. A layer of royal icing on top of a cookie gives you a smooth, clean, crumb-free base for further designs, whether you’re planning on piping or drawing. This kit makes it easy to flood that royal icing onto the cookies, and also includes tools for fancier techniques. The etching tool is used to add details using the color dragging technique, and the 3-pronged comb is used for marbling and feathering. The silicone scraper tool is used for making smooth, flawless edges. You don’t need to be a decorating expert to use these tools – they’ll make the job much easier for novices as well, and much easier than trying to use a salad fork or chopsticks as substitutes. If you make cookies, you absolutely need this spatula. The design is perfect for sneaking under baked cookies on the cookie sheet, even when the cookies have spread or are close to the edges of the pan. If you’re making bar cookies, this is ideal for getting those brownies or lemon bars out of the pan, too. 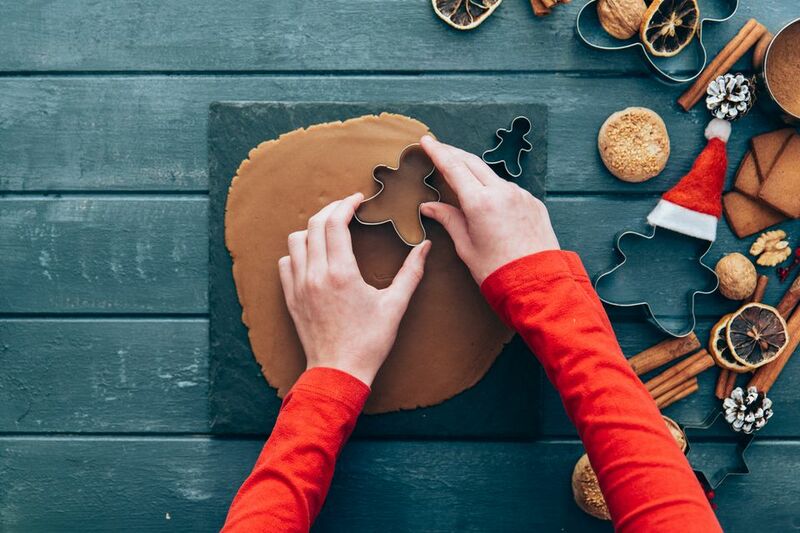 The soft silicone edge won’t damage nonstick surfaces or gouge baking mats, yet it’s thin enough to slide easily under the cookie while the rigid center keeps the cookie flat, so it won’t crack or break. The cookies slide easily off of the nonstick surface of the spatula. You can also use this to transfer unbaked cookie dough to your baking sheet, and the rounded edge of the spatula can be used to scrape dough from spoons or the corners of a mixing bowl. When you’re done baking, you can use the spatula for savory foods like small burgers or pancakes. Since it’s heat resistant to 600 degrees, you can safely use it in very hot pans, and the spatula is dishwasher safe for easy cleaning. If you’re baking cookies, a good baking sheet can make all the difference. Thin sheets can warp, and cookies are more likely to burn. This half-sheet aluminum pan is made to last. The half-sheet size refers to commercial bakeware sizes, and is the largest sheet that will fit comfortably in home ovens. The aluminum conducts heat evenly so your cookies will rise and bake evenly, and the reinforced rim keeps the sheet rigid, so it will never warp. Since this doesn’t have a nonstick coating, you don’t need to worry about using metal utensils to get under cookies or to scrape up burned sugar. When you’re not baking cookies, this can be used for roasting vegetables, baking meatloaf or even roasting a chicken. This sheet is made in America and it should be washed by hand. This mixing bowl set is just retro enough to be highly fashionable, and it’s durable as well. The four piece set nests easily for storage and gives you options for just the right bowl size for pre-measuring ingredients, or for mixing large or small batches of cookie dough. The set includes a 4.75 quart bowl, a 3.4 quart bowl, a 1.75 quart bowl and an 18-ounce bowl. The bowls have a rim that makes them easy to hold onto, and they’re attractive enough to use for casual serving, for snacks or as a fruit bowl. They’re made from colorful melamine that is dishwasher safe. These should not be used in the microwave. This set is available in several different color combinations to match or contrast with your kitchen décor. Making cookies? Then you need a cooling rack, or two. How about three? This set of three racks is just under 10" x 16", which is large enough to comfortably hold a dozen average cookies, but not so large that your moving things around to make space. Each rack has fold-down legs, and the legs allow the racks to be stacked, so you can cool three batches of cookies in the space of just one rack. These have a nonstick coating for easy cleaning — and the cookies will never stick. They are dishwasher safe, but very easy to clean by hand. The racks are not oven-safe. Sure, you can use a pair of spoons to portion your favorite drop cookies onto a baking sheet, but it’s nearly impossible to make cookies all the same size using that method. A cookie scoop solves the problem, and it makes the job much faster. Just dip into the dough, scrape the excess against the side of the bowl, and squeeze the handles to deliver the ball of dough to the cookie sheet. The soft-grip handles are easy on the hands, so you can fill several sheets full of cookies in comfort. This medium-sized scoop holds 1 1/2 tablespoons of dough. If that’s not your perfect cookie, there is a small scoop that holds 2 teaspoons and a large scoop that holds 3 tablespoons. When they’re not in use making cookies, you can use them to scoop fillings into deviled eggs, to portion cupcake batter into mini muffin cups, or to get creative with your ice cream servings. The scoop is dishwasher safe for easy cleaning.